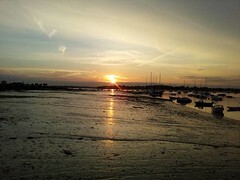 Sunset at Itchenor, taken by Mike after a visit to the pub. Arriving at Itchenor provided us with an opportunity to practice picking up a mooring a few times. The first mooring I was sure the space we had was going to be a bit tight for us and other vessels, so we moved on. The second turned out to be a red/orange, residents, mooring, and we were advised it would be best for us to move onto a white, visitor's, mooring as the owner was likely to return. The third, visitors, mooring was already occupied, but the guys in the harbourmaster's boat assured us that they allowed up to six vessels to raft up on one buoy at a time. I can't imagine a series of up to six boats rafted up on a row of buoys all swinging on the wind and tide without some kind of mishap. Two of us on one mooring worked out perfectly fine though. Glen and Mike came sailing on Arctic Rose again. 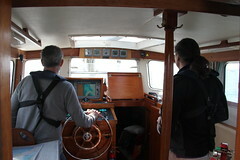 Here you see Mike on the helm, with Glen supervising, as we head out of Southampton water relatively early on Saturday morning. Plenty going on, but not a lot of wind for sailing.